In this article I will demonstrate how to create an EXTJS grid representation of a view using a custom control and 3 custom properties. At the end of this article you will be able to drag and drop a custom control onto your XPage, give it the count, the viewName and the name of the placement element and a grid will be created for you without any further coding. In XPages we want to be able to genericize everything down to a re-usable custom control and in this example I will show you how to add a grid to your XPage doing just that. The following XPage source code is all that is needed to create this basic grid capability. 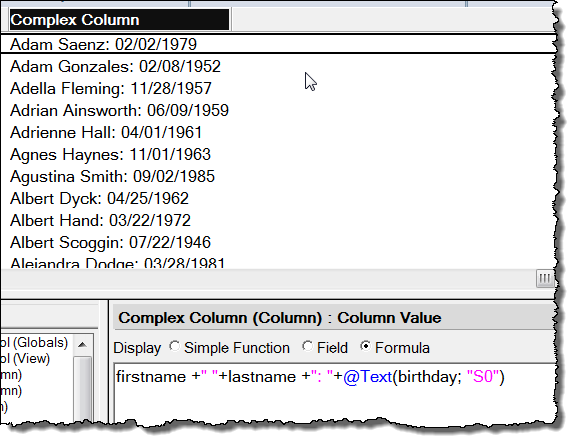 The view ByName-First5Col is a simple view of 5 columns containing a single field in each column but as we will see this control will handle any number of columns. I added the REST control to the Custom Control itself for simplicity and to make it more portable. This does have the restriction (at this time) of only having one grid on a page at a time. The pathInfo and id of a REST control cannot apparently be computed at build time so I have to keep them static. I am sure there is a way around it…in the mean time the viewName is passed in via compositeData as well as the count. As I think about it you could probably give control to the user using scoped variables and have them select the number of documents displayed…but that is for later. The viewName is also passed into the EXTJS code so that it knows where to look for the REST service on the page. The EXTJS code is then simplified because we are passing in the fields and columns values already computed above. Below is the code for the whole Custom Control. As you can see below – a grid, same as we had before. But now we can add a new column to view and without changing the control itself the new column appears on the web. And even complex columns with combined field values. With this Custom control we are able to begin to create the ability to add these EXTJS grids to our XPages, very quickly and very effectively. As we go through the series I will update the custom control with the new capabilities as we look at new grids. Eventually we will have a plethora of controls which can be used to create powerful grids in next to no time at all. I’m enjoying the series so far Marky. Looking forward to learn the best way to “open” a document using this technique. Thanks Shean, I always appreciate feedback – glad you are enjoying it. I would be very curious to know how you did it “Grid With Pager”. The database that you shared is out of date. It appears the download link is broken. Sorry I am running an update for tomorrow’s article. Please check again then. so that the variable names are calculated with the id of the CC in the xpage. Thank you Oliver – nice suggestions!! Yes Grouping – definitely going to get to that in probably article #9 or #10 with the new 4.2 BufferedRenderer infinite scroller which is just amazing! !